PPC waste example - don't do this! 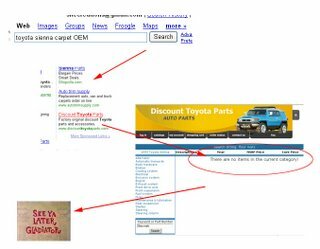 PPC waste example – don’t do this! 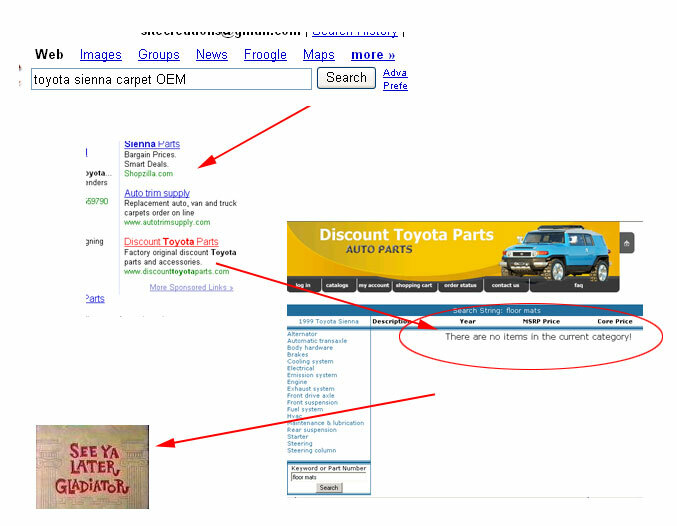 We need some new carpet for our Sienna so I popped online and found an ad that looked pretty good…. and what do you know, blog material! Here, a classic case of broad match and a lack of negative keywords. This merchant has put up a shotgun toyota parts campaign – but doesn’t sell interior parts, at least from what I can tell. My query gave them plenty of chances to negate it – and save the $1.50 or so my click cost them. I’ll bet that with an hours’ time investigating it, we could come up with a list a few hundred terms long that would chop 20-30% off their PPC spend without having any negative effect on performance. BuzzMaven wins 2010 SEMMY award – thanks to all.